Products :: Kitchen :: Coffee Urn Large - AAA Event Services - Your One Stop Shop for all your Production Equipment Rental Needs! 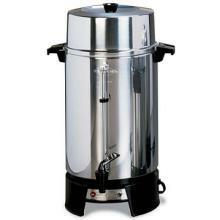 This Westbend coffee urn quickly brews one cup of coffee per minute. The urn is designed with a two-way dripless faucet twist on the outside, a cool-tip filter basket, a lock on the cover, and interior water level markings.